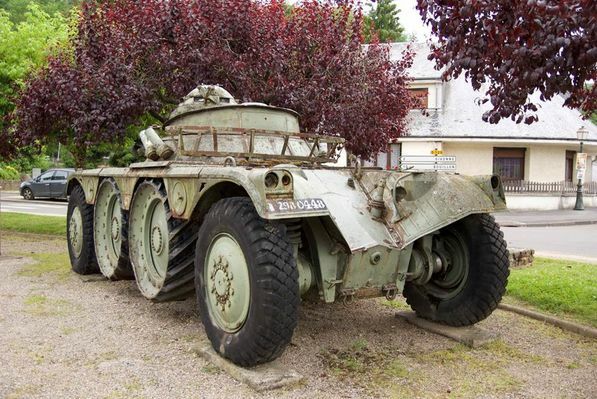 This light armoured reconnaissance vehicle is on pneumatic tyres rather than caterpillar tracks. It displays the insignia of the 12th Regiment de Chasseurs (Cavalry Regiment), emblematic of Sedan. 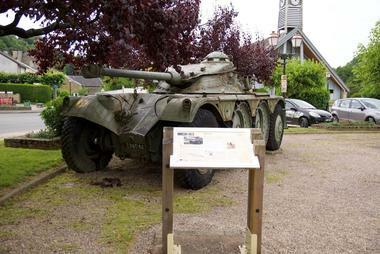 This unit was disbanded in 1984 and its training ground was near Daigny. 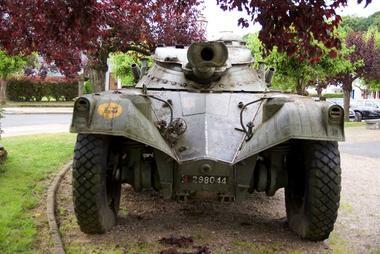 The cavalry was replaced by this armoured car before the second World War. Sedan was a garrison town for nearly six centuries, mainly for cavalry units, from the start of the 15th century to the end of the 20th century. Both the town and the surrounding countryside retain traces of this that contribute to the historic value of the region. The Givonne valley, which has always been a frontier region, often had to defend itself against armed invaders. Four ‘maison fortes’ (literally strong houses) were constructed, namely at Givonne, Daigny, La Moncelle and Bazeilles, of which only the last two still remain. It has also suffered Franco-German wars three times in 75 years, in which have ravished the Sedan region, but it was the drama of the 1 September 1870 that left the worst memories: hundreds of corpses scattered around Daigny after the battle, as in neighbouring villages. Only a proportion of those fallen were buried again in cemeteries, while others disappeared in scattered graves. 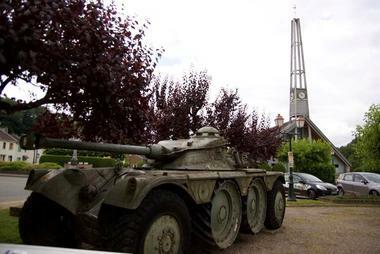 There is no review about Engin Blindé De Reconnaissance - Place De Daigny, be the first to leave one !